Last time out, we looked over the Cavaliers’ biggest threat to their Eastern Conference dominance, the Indiana Pacers. Well, after an ugly, tightly-contested series, the Cavs were able to put the pesky Pacers away in game seven of the first round. With the series-clinching win, the Cavs had one day off to head up to Canada, where things will get a little paleolithic. After putting away probably their toughest possible matchup in the Eastern Conference Playoffs, the Cavs face off against a familiar foe in the Raptors. The Cavs have faced the Raptors the last two seasons in the playoffs, winning 4-2 two seasons ago and sweeping them last season. The Raptors have only defeated the Cavs once in their last eight attempts. In six of those seven Cavalier wins, LeBron James scored at least 30 points. 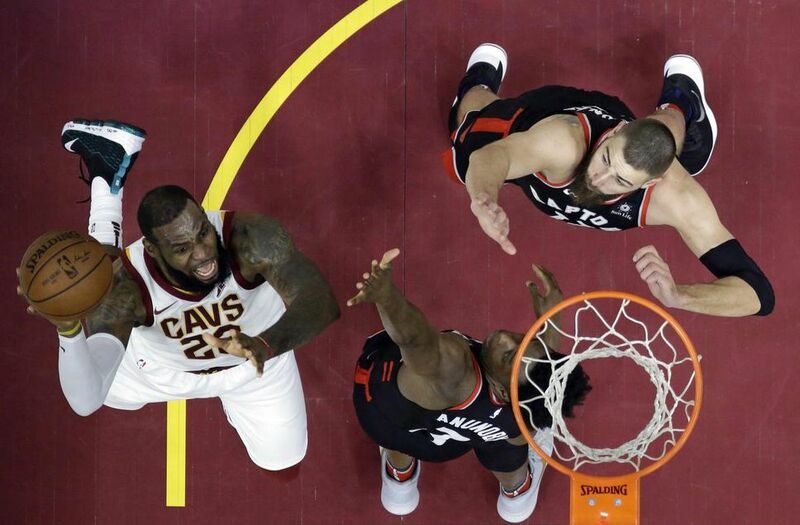 So since last year’s playoffs, the Cavs beat Toronto 75% of the time when James hits that goal. 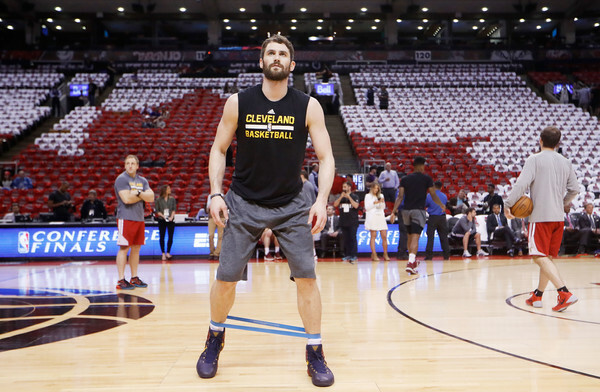 Kevin Love has been the difference between beating and losing to the Raptors. In two wins over the Raptors, Love has averaged 20.5 points and 13.5 rebounds in nearly 30 minutes per game. In the one loss, he mustered 10 points and 9 rebounds in 23 minutes. The Raptors only win over the Cavs this season was a 34-point blowout, in which the Toronto bench outscored that of Cleveland 76 to 48. At point guard, things favor the Raptors. Lowry, who has been notorious for being bad in the playoffs, was solid in the team’s series with the Wizards averaging 17.2 points, 8.3 assists, and 2.0 steals. Hill, on the other hand, has been battling a back injury and it sidelined him for three games is only averaging 9.3 points, 2.0 rebounds, and 2.3 assists. Cavs head coach Ty Lue also shared that Hill will be on a minutes restriction due to his back issues. Due to Hill’s injury, he will be limited for the first few games against the Raptors. But, he will still be able to provide solid defense and help contain the dynamic duo of both Lowry and DeRozan. Unless he gets his scoring going, though, he will still be outclassed the always-steady Lowry. Point Raptors on this one. At the other guard, it is a battle between DeRozan, the Raptors’ best player, and Smith, the Cavs’ streakiest player. DeRozan was killer in the Raptors’ first-round series against the Washington Wizards, with averages of 26.7 points, 4.8 assists, and 3.3 rebounds. For the Cavs, Smith averaged 8.6 points, 3.0 rebounds, 1.0 assists, and a few clutch three-pointers. Against the Pacers, Smith was primarily used to defend both Victor Oladipo and Darren Collison. Smith did an admirable job as Oladipo had a few mediocre games and will be expected to assist Hill and LeBron James in containing Lowry and DeRozan. As mentioned before, DeRozan has been the best dinosaur for the Raptors and containing him will be one of Cleveland’s top priorities. This battle once again goes to Toronto. Do you get nervous before playoff games? OG: "I have no reason to be nervous." Are you looking forward to playing Cleveland? OG: "Because we want to beat them and because that's our next opponent." OG, asked about LeBron's physicality: "He's pretty strong, but I feel like I'm strong too." The last quote really stands out and is maybe Anunoby’s death sentence. Scientists have speculated that a meteor is what killed out the dinosaurs. Well, it actually might be King James who makes these Raptors go extinct. James has an 8-2 playoff record against the Raptors, to go with averages of 30.0 points, 8.4 rebounds, 6.1 assists, and connects on over 60% of his field goal attempts. Anunoby is going to join the likes of PJ Tucker in being a “LeBron killer” that ends up getting killed. Anunoby is no Jaime Lannister and the Cavs have the clear advantage at the small forward spot. After a stinker against the Pacers, the Cavs will look early and earnestly to get Love going against Toronto. They can easily exploit the matchup against Ibaka and will also look to force Raptors center Jonas Valunciunas on Love as well. Valunciunas is a lead-footed traditional center and cannot defend perimeter shooters at all. The Cavs will force both Love and James on Valunciunas to exploit this and help find a wrinkle on offense. Point Cavs on the power forward battle. Speaking of Valunciunas, he will go to battle with Canada’s own in Tristan Thompson. Thompson was the hero of game seven against the Pacers, earning a surprise start and finishing with 15 points and 10 rebounds. Thompson showed the grit he has been lacking all season against the Pacers, coming up clutch on the offensive glass and providing some bone-crunching screens. He did an admirable job containing Myles Turner, and will against have his hands full against Valunciunas. Valunciunas was steady against the Wizards last round with averages of 13.5 points, 9.6 rebounds, and 0.9 blocks. While Valuncinuas is easily exploited on the perimeter by Love on defense, he can equally exploit Love’s weak defense as well. If Toronto exploits the issue on offense, Valuncinuas’s impact will be felt. The Cavaliers coaching staff will throw Thompson into the fire and if he continues his solid play from game seven, will do a good job keeping Valunciunas at bay. In the end, the Raptors do get a slight nod with their starting five. For both the Cavs and the Raptors, each team’s respective best players outshine the other team’s. The real battle will come down to the bench units, and the Cavs may have a slight advantage compared to Canada’s only team. For the Raptors, the key bench players are Jakob Poeltl, Pascal Siakam, CJ Miles, Delon Wright, and Fred VanVleet. The Raptors built their own bench through smart drafting and free agent signings, and the biggest X-Factors are Poeltl and Miles. Poeltl has bad a panache for bullying the Cavs in the past and will give backup bigs Larry Nance Jr. and Jeff Green some problems He has been solid and reliable in relief of Valunciunas and the Cavs need to ensure that he does not become a problem quickly. Miles, on the other hand, is a curious case. The former Cavalier got paid after showcasing his three-point shooting ability for the Cavs many moons ago. The problem is, though, that Miles was frustratingly inconsistent at times when with the Cavs. Whenever Miles is off, he is really off and can make or break the bench battle. The Cavs should strive to keep Miles off-balance throughout the series so he does not hurt his former team. The last series against the Pacers, the Cavaliers bench looked pedestrian compared to their regular season numbers. The tandem of Jordan Clarkson and Rodney Hood were ultimately ineffective and were outshined by professional troll Lance Stephenson. Larry Nance Jr, the other key bench player, battled foul trouble throughout the series and struggled much like Love against Indiana’s bigs. The thing is, the past is in the past and the Cavs’ bench may have an easier time finding their groove against the Raptors. Statistically, the Raptors were one of the worst defensive team against the fast break in last round of the playoffs. Clarkson goes from 0-100 in no time at all and can exploit Toronto’s slower-defense. As mentioned before, Hill is on a minute restriction and Lue should sub Clarkson in for him to allow him to get into a groove when sharing the floor with LeBron James. Clarkson has been quoted numerous times that he believed humans used to be giants and kept dinosaurs as pets. Heading into round two he can be vital in putting the Raptors’ bench on a leash. The other X-Factors for the Cavs’ bench is three-point shooting, which they struggled with in the first round at 32.2% as a team. During the regular season, Kevin Love, George Hill, and even Jose Calderon torched the Raptors from the perimeter and it should be expected that Rodney Hood and Kyle Korver should be able to as well. It is a toss-up, but with an eye test, it feels like Cleveland’s bench wins the battle against Toronto’s. The final matchup in this series is between Raptors head coach Dwane Casey and Cavs head coach Tyronn Lue. In the regular season, Casey coached the Raptors to the overall best record in the Eastern Conference at 59-23. Lue ended up at fourth in the East and an overall record of 50-32. Both coaches struggled in their first-round series, but with more fans calling for Lue’s job after getting smoked by the Pacers twice. Casey did coach the Raptors to a great record but he still has not been able to solve the mystery of the Cavaliers and LeBron James. Ty Lue might not have solved it either, but having James on his team gives Lue the slight edge over Casey. So after comparing starting units, bench mobs, and head coaches, the Raptors and Cavs are tied 3-3. Despite the regular season success, the Raptors simply do not have the star power compared to the Cavs. Love and most of all King James easily outshine Lowry and DeRozan and James has a personal vendetta to ruin Raptors fans’ dreams. It will be a tightly contested series, but in the end, the Cavs pull away in six games. Drake will probably hop on the bandwagon too since it is something he loves other than his bed and his mom. In the end, like life, LeBron James finds a way to make it back to the Eastern Conference Finals. He will, however, require a much more consistent effort from the likes of Kevin Love and other starters.